Labour stepped up the pressure on David Cameron today with a new poster mocking his airbrushed pre-election pledge, and a new “Borrowing Counter” website. Labour stepped up the pressure on David Cameron on the eve of the Tory Party conference today with a new poster mocking his airbrushed pre-election pledge, and a new “Borrowing Counter” site that tots up the cost of the Conservatives’ economic failure. Borrowing increased by £802 a second in the first five months of 2012 compared to the same period last year – a result of the prime minister’s failing economic plan and the double-dip recession, with borrowing now going up and not down. According to the Office for National Statistics (excluding the transfer of the Royal Mail pension fund), public sector net borrowing was £59 billion in the first five months of the 2012/13 financial year, compared to £48.4 billion in 2011/12. [See: Public Sector Finances, August 2012, ONS, 21 Sept 2012 (pdf)]. This is £10.6 billion (or 21.8 per cent) higher than borrowing in the same five months of last year. It means that, compared to the same period last year, in the first five months of this year the UK was borrowing: £69.3 million more a day; £2.9 million more an hour; £48,112 more a minute; £802 more a second. 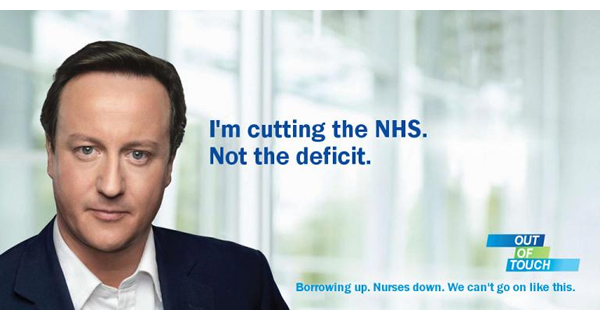 On the National Health Service, meanwhile, David Cameron’s infamous airbrushed poster in the run-up to the 2010 general election pledged to “cut the deficit, not the NHS” – yet official Treasury figures reveal that, since 2009/10, NHS spending has fallen from £105,073 million to £104,333 million in real terms. [See: Table 1.9, Public Spending Statistics, July 2012, Treasury (xls)]. In May 2010 when the Tories came to power there were 281,431 Full Time Equivalent (FTE) qualified nurses working in the NHS; the most recent figures show this has fallen to 275,930. [See: Monthly NHS Hospital and Community Health Service (HCHS) Workforce Statistics in England, NHS, 25 Sept 2012 (pdf)]. The NHS: Safe in Cameron’s hands? Nothing like ignoring the debt is there. Borrowing is not the only debt. Of course you won’t mention the other debts. After all, would you be re-elected if people discovered you had been cooking the books to the extent of 6,0000 bn? Debts – that’s what matters. That’s why you’re going to default on the pensions. You can’t afford to pay it. People don’t yet know because of the fraudulent accounting. Yes, you’re ignoring the debt. Your policies are raising it, after all, since you place a higher priority on slash and burn. YOU are going to try to default on pensions, to boost your shares. Your accounting is fraudulent, yes. From what I can tell Labour is not going to really repeal the Health Act if they get into power, and they’re quite content to keep the PCTs privatised, which is the only really important part of the legislation that needs to be reversed.